Arena Exploit? Can someone please explain this? 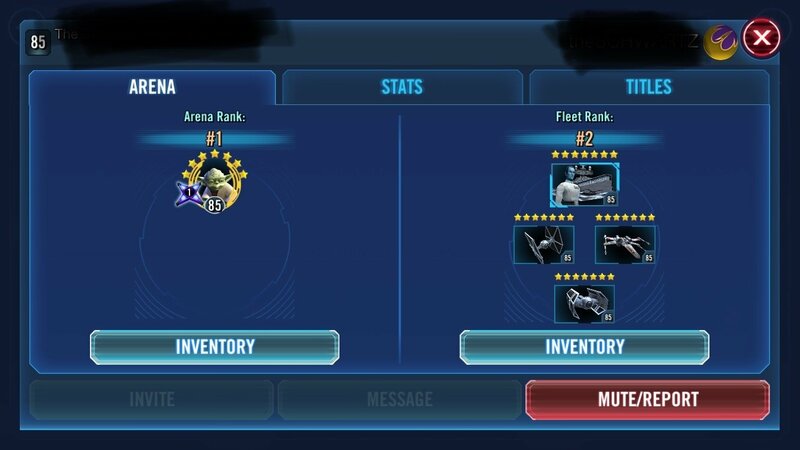 Tell me if I’m wrong but is this player intentionally using Hodas retreat mechanic so that every time a player attacks him Hoda retreats and the match comes out as a draw? I smell something fishy and yet strangely cheesey. Yes, definitely the fabled 'poisson au fromage'. I'd say that's worthy of a report and let the devs sort it out. The other team will automatically win. 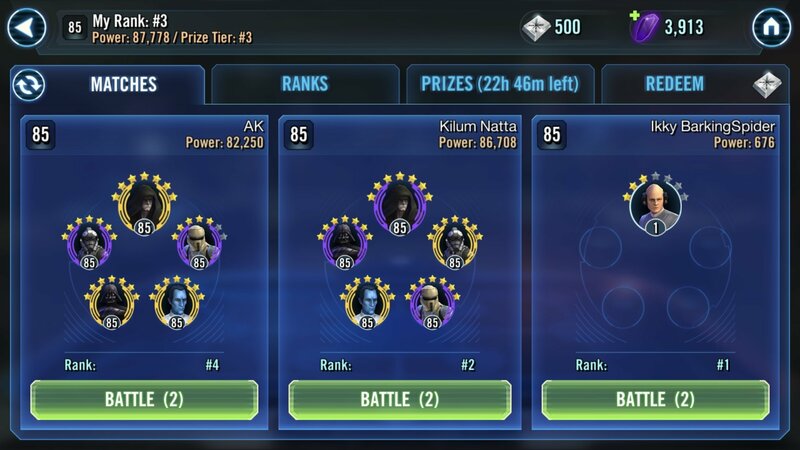 Looks like someone took first with another team and then changed their team to hyoda to allow others to take first. Or an interesting strategy to make it hard for someone to battle him and take the full 5 minutes while battling for 1st at payout! Yeah, I'm just going to go with the "good guy move" giving the next person an easy win that they don't need to take five minutes for. Sounds kind of like one of those shard collusion things that "doesn't happen." Lol, Execute good guy move and gets accused of exploiting. Because maybe his regular arena team is hard to beat for people in the next payout. This person obviously has no trouble getting back into 1 during theirs. No need to block others out for 23 hours. You mean: Sounds like shard cooperation that everyone acknowledges does happen. People say collusion doesn't happen because it doesn't. Personally I would just remove my Speed arrows, it’ll save up on Arena attempts but it’d cost some credits, and remembering which arrow goes where after that. No good deed goes unaccused of cheating. Yes, he took first at his payout then paved the way for people after him to do the same. Why let EA keep crystals? Don’t be naive. My shard chat brags about how many people they have driven from the game because they couldn’t break through the “cartel”. Think about it yourself, if hermit escapes, which he would, then It’s a loss not a draw, the attacker would get the win, and Then he will get knocked down a spot. So yes he is simply helping his arenamates rank up after his payout. Have you not fought a squad with hermit on it? Save him for last, Cuz he auto escapes, which gives you the win. Heck when hermit was first released there was a bunch of threads about how he auto escapes and how he does no damage, and it’s like only using four chars on your squad. By using hermit s9lo there, that is literally simply to make it easy for mins arena mates to win. That’s all.it is. In arena it's not a draw when an enemy Hoda retreats, it's a win. I fight a Hoda team daily. 80 percent of the posts have no idea how Hoda works and defends him as WAI good guy. Smells like a propaganda effort. Can you clarify which bits are wrong, and why it's not a nice thing he is doing in giving people an easy win? I think you're in the 20%. (1) He's setting it so no one can lock him. If someone attacks, he can instantly retake the top spot at payout. This would assume he's in a shard chat and perhaps has 1 competitor who isn't. (2) He's just over nurfing for his squad mates to let them grab first, then he'll change his squad back to what probably is traya. Please post a link to the video of this happening. I have played in arena against teams with HY and left him for last causing him to retreat and giving me a win. It is common now with the jedi being viable. Maybe it is different if he is the only 1 but I dont see why. Yes - and some people actually enjoy playing the game. So he'd put in a strong team later on the next day (or try different ones) and fight his way back up. We've had a couple of people do it on our shard. It's not a trap or a lock or anything of the sort. It's a "go ahead, beat me" move. The funny thing is that the people that do it are amazed they don't drop farther because everyone is paranoid and doesn't attack them (as evidenced by many of the misinformed posters in this thread). It's a lot more fun than smashing your teams up against HSith for garbage rewards. Traya meta is rough. hes doing this to help his teammates in the arena chat, obviously. its not a tie, and it's probably not to "lock" himself. He surely have help of his shardmates if needed. It's "cooperation" if you're in on it. It's "collusion" if you're on the outside.